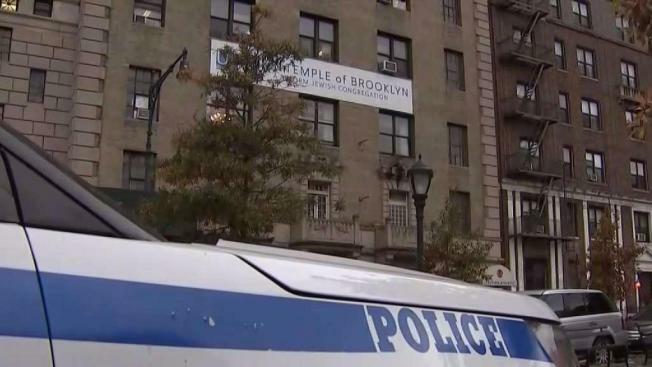 Hate-filled messages were scrawled inside a Brooklyn synagogue, the latest incident in a string of alarming attacks on New York City's Jewish population in the borough, police say. The anti-Semitic messages written in black marker at Union Temple in Prospect Heights come less than a week after a gunman stormed into a synagogue in Pittsburgh, killing 11 people. The NYPD said the messages, which include “Die Jew Rats We Are Here,” “Jews Better Be Ready,” "Rose" and “Hitler,” were discovered by a woman congregant around 8 p.m. Thursday on the second and fourth floors of the house of worship. A political event hosted by “Broad City” star Ilana Glazer was canceled after the messages were found. A video posted to Instagram shows Glazer addressing a crowd. Glazer was scheduled to moderate a talk with a journalist and state senate candidates, including Andrew Gounardes. Gounardes told News 4 he had been "incredibly excited" to appear on Glazer's series and to work alongside State Senate candidate Jim Gaughran and Amy Goodman of "Democracy Now!" to talk about the importance of the election. "Hate speech and anti-Semitic graffiti have no place in New York State. I am outraged that cowards would make threats and deface property to spread their hate," he said in a statement. "I am proud to stand with my brothers and sisters in the Jewish community and all religious affiliations because we are all Americans and all New Yorkers." A Hate Crimes Unit is investigating.